It is a DC Analog Ammeter,Measuring Range:DC 0-500mA,The basic error: + - 2.5%,Damping response time.. It is a DC 0-100A LCD Digital Ammeter,DC 8 ~ 12V Powered,Measuring rang: DC 0~50A,Operating current:.. It is a Lcd Dual Display Digital Voltmeter Ammeter 2in1, Measuring Voltage Range: DC 0 ~ 19.99V, Me.. It is a 2in1 Voltage Meter Ampere meter, Measuring Voltage Range: DC 0~199.9V, Measuring Current Ran.. It is a 2in1 Tester Dual Display Digital Voltmeter Ammeter, Measuring Voltage Range: DC 0~199.9V, Me.. 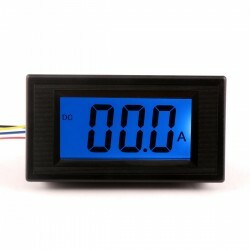 It is a 2in1 Monitor/Tester Lcd Dual Display Digital Voltmeter Ammeter , Measuring Voltage Range: DC.. It is a DC 0-20A Digital Ammeter,Operating voltage: DC 8 ~ 12V,Operating current:.. It is a Digital Voltmeter Ammeter 2in1 Volt Meter Ampere Meter, Measuring Voltage Range: DC 0~600V,.. It is a Multi-function Meter Voltmeter Ammeter, Voltage Range DC 10-75V,Current Range 0-20A, With .. It is a 2in1 Volt Amp Panel Meter, Measure Voltage Range DC 0-100V,Measure Current Range 0-10A forwa.. It's a Digital Voltage Current Meter,Voltmeter Range: DC 4.5-200V,Ammeter range: 0-9.99A,Measurement.. It is a DC 12V 24V Digital Ammeter/Ampere Meter/Tester, Measuring Current Range: 0~49.9A, Power Supp.. The 200A Shunt Resistors is DC Ammeter Accessories . Shunt Main By Manganese copper And Copper conn.. It is a 0~300A 75mV Resistive Shunt Electric Shunt Resistance Resistor Kit, Shunt Main By Manganese ..